Caution: Massive spoilers for The Amazing Spiderman 2 movie ahead. I love my superhero movies. They are (usually) so formulaic, with those dependable bits like hero discovering his powers, hero going through some angst related to parents (this can come before or after the discovery of powers), hero falling in love with plucky, ‘independent’ woman, hero’s nemesis being born, hero’s nemesis pursuing whatever shady goal he has, hero confronting nemesis and being thrashed (this can go for two rounds), hero going through dark phase of self doubt until someone says something inadvertently wise and hard-hitting, and finally, hero defeating nemesis and peace reigning. All set to epic soundtracks, usually crafted by Hans Zimmer. The latest instalment in Sony’s reboot of the Spiderman franchise, The Amazing Spiderman 2, follows this pattern. It’s well-made, entertaining and has exactly the sort of humor and emotion that one can expect from a big-budget superhero movie. Spiderman has always been ‘lighter’ in tone than Batman (especially the latest avatar of Batman, Christopher Nolan’s s triplets), so you can expect less philosophical reflection on the state of man’s existence and more feel-good quips and homely spiels about bravery and hope that go well with the popcorn. 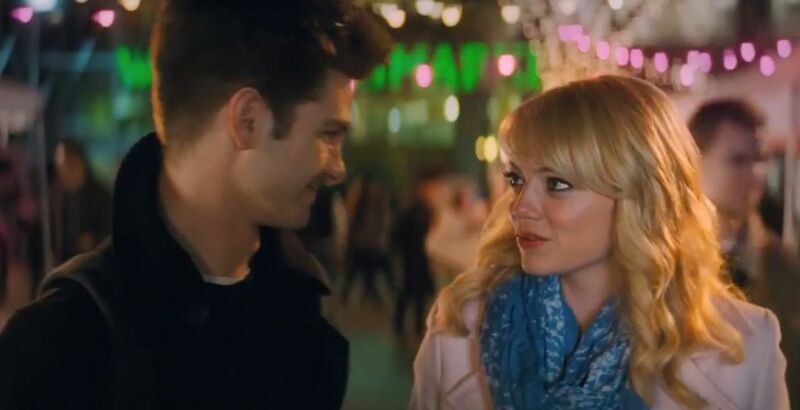 What’s different about Amazing Spiderman 2 (and AS 1 for that matter), is the hero’s ‘love interest’, Gwen Stacy. I know it’s unfair to compare Emma Stone’s sassy, smart, science-loving Stacy to Kirsten Dunst’s more ‘traditional’ girl-next-door Mary Jane Watson, but the differences between them, really, is where the former’s importance lies in superhero (comic and especially movie) canon. I, for one, fell hopelessly in love with Gwen in this instalment, and this post is going to function both as an obit and a love letter to her. Gwen Stacy is a living, breathing negation of the Loving Hero Paradox. She looks it in the face and she seems to say, ‘to hell with it’. At the start of the movie, Gwen confronts a dithering Peter, who is going on about how he ‘cannot lose her’ and hence ‘cannot be with her’. She calls him out on the stupidity of that statement straight up, before going on to say that she’s had enough of it and is breaking up with him. ‘I am breaking up with you,’ she stresses, highlighting who’s taking the final call in this case. And then of course she goes about her life, meeting her friends, applying to kickass Oxford scholarships, and generally ignoring poor lonely Peter, who skulks about in Spiderman gear spying on her. Finally, it is she who takes the decision to meet him ‘as friends’, she who calls him and says she’s gotten into Oxford and that’s she’s leaving (note: she does this on her way to the airport, stating that it’s ‘easier this way’, reversing the usual equation where it’s the boy who summarily cuts off the beloved with a phone call) and inciting him to come after her and state that he will ‘always follow wherever [she] goes’. It’s her career and location that is important, he stresses; there will always be crime to fight, no matter where in the world he is, so he is completely at her disposal. All this is great, and a very refreshing change from the usual girlfriend in superhero movies, wherever the girlfriend does exist. Compare Gwen’s assertiveness, for instance, to Natalie Portman’s Jane in Thor (1 and 2). Jane is a brilliant physicist, doing cutting edge work in her field, very attractive and certainly not lacking in a support circle. Yet, she is the one who is left waiting for Thor to show up, who rails at him rather ineffectually for a while (in Thor: The Dark World) for not calling, and then needs to be rescued because the ‘ether’ has, rather conveniently, infected her mortal system. Jane then gets hauled around the Nine Realms whether or not she wants it, and forced to undergo various treatment attempts. As far as I’m concerned, Gwen’s greatest moment (in a series of great moments) is when she cuts herself free of the webbing binding her to a car (this after Pete’s declaration about ‘following’ her everywhere) and turns up to help him fight Electro. ‘This is my choice, mine!’ she declares and then proceeds to be as indispensable and instrumental to the villain’s destruction as her boyfriend. After all, it’s she who finally releases the electric charge that gets rid of him. And then, after all this rubbing in of her awesomeness and general ability to fend for herself and make her own decisions, Gwen…dies. Anyone who’s familiar with the comics knows the fate that awaits her. Editors at Marvel remarked that they had ‘killed Gwen because [they] didn’t know what to do with her’ any more. She was too close to Peter, too much of a dependable source of support. The only way in which the relationship could progress was for the couple to get married, and that didn’t sit well with anyone in the publishing house. Marriage, they felt, would be a betrayal of ‘everything Spiderman was about’, dissing the notion of ‘personal tragedy’ that forms the motivation for Peter’s whole superhero gig. Of course, in the comics, there is the added detail that Gwen doesn’t know Peter’s secret identity, and marriage (and greater closeness) would entail divulging this to her, again something the bigwigs at Marvel didn’t want happening. What does this say, really? Here we have a girl who’s willing to take risks, to stand up for herself and not just be the passive following girlfriend, and she gets axed because there doesn’t seem to be a future for the man. Not Gwen, but Peter. Who cares if Gwen wanted to go to Oxford and be a famous molecular biologist; what matters is that Peter needs more tragedy to fuel his Spiderman-self and the only way we can have that happen is by killing her off. Considering that the comic is called ‘Spiderman’ and not ‘Gwen Stacy’, this might be expected. But I can’t shake off the feeling that, coming after all Gwen’s insistence and desire to be a part of Peter’s Spiderman-life, her death is more than a little disturbing. Does it add credence to Captain Stacy and Peter’s agreement to ‘leave her out of it’? Does it somehow insinuate that the men were right after all, that they knew better how to police and direct her life than she herself did? By giving her a degree of agency and then killing her almost as a direct result of her own choices (after all, if she hadn’t cut herself free and come to his aid, Gwen wouldn’t have been around the electricity grid for the Green Goblin to kidnap), the makers and writers of Spiderman seem to be saying that yes, you can defy the Loving Hero Paradox, but only at a great price. You can ‘become hope’, as Gwen says memorably in her valedictorian speech, but only for someone else, and at a great cost. After all, it’s so poetic when a beautiful, independent woman becomes the fuelling memory for a male superhero and the core of his angst; so much neater than if she lived, went on to do great things in her chosen field and (heaven forbid) married said hero and ‘forced’ him into dreaded suburban domesticity. Whatever, Peter Parker. I hope you make Gwen’s ‘sacrifice’ worth it in the next movie. I won’t count on it, though. She was and is my favourite part of the rebooted franchise (in fact, the entire franchise) after all.